KATHMANDU, Oct 20: The Ministry of Federal Affairs and Local Development has said that all the earthquake victims in Kathmandu Valley whose houses were damaged by earthquake will receive the first tranche of the total grant of Rs 300,000 before Tihar. Ganesh Awasthi, the chief of the implementation department of the ministry, said that the local bodies in all the three districts of the Valley will start signing grant agreements with the eligible quake victims by end of this week. "And by Tihar, we would have already transferred the first installment to the bank accounts of all the eligible victims in the Valley," he added. Quake victims in the Valley will be getting the grant amount for reconstructing their damaged houses after 18 months of the earthquakes. Many quake victims in the Valley are still living in temporary shelthers in lack of money for reconstruting their damanged houses. 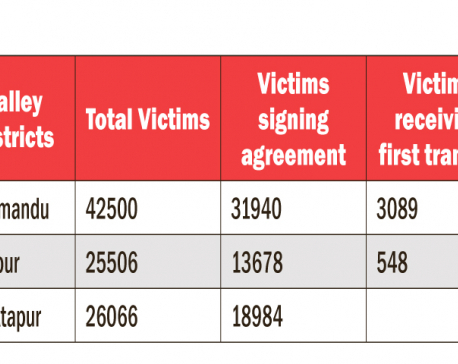 The Central Bureau of Statistic had completed the damage assessment survey of as many as 115,671 houses in all the three districts of the valley and forwarded the survey records to the National Reconstruction Authority (NRA) for the purpose of identifying eligible houseowners from the total surveyed damaged houses before Dashain. In the first phase of verification, the NRA has found 51,000 quake victims in the Kathmandu Valley eligible for the grant amount. The NRA is in the final stage of verifying eligibility of other remaining house owners. NRA officials have assumed that altogether around 100,000 claimants are likely to be qualified for the grant amount in the Valley. "We have already forwarded the name list of the 51,000 quake victims to the respective local authorities and have asked them to begin the process of signing grant agreements by the end of this week," Awasthi said. The names of the remaining eligible victims will also be forwarded to the respective local bodies once the NRA completes the verification process. According to him, enrollment camps will be established at various places in the three districts starting Thursday to begin the task of signing grant agreements with the quake victims. "On Thursday, the local authorities will make public the names of the quake victims and ask them to come up with necessary documents for signing the grant agreement. And from Friday onward, the grant signing process will begin," he added. He said that the first intallment of Rs 50,000 will be subsequently transferred to the bank accounts of the quake victims signing the grant amount.